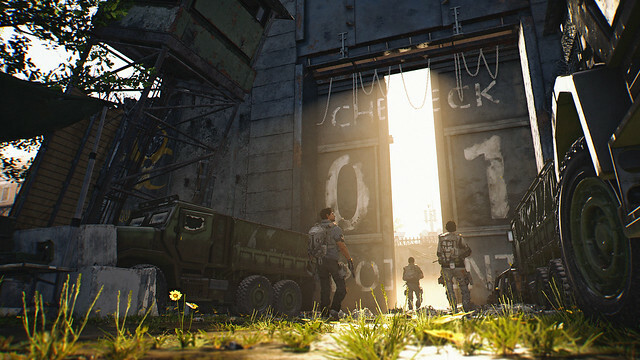 The Division 2 takes place seven months after the events in New York City that occurred in The Division. Washington D.C. is being overrun by three factions: the Hyenas, Outcasts, and True Sons. The Division has been dispatched to the Capitol to restore order to the chaos once again. Right off the bat, you notice the load times are much better than the first Division release. Ubisoft has done a great job optimizing the game this time around and CPU usage is also much lower. Overall, the game is smoother and more responsive but came with its fair share of small bugs at launch (which is normal for this type of game). Ubisoft claims the map is a 1:1 representation of the actual city. I’ve personally never been to Washington D.C but I can say the map is gorgeous and the landmarks are stunning. The city looks similar to how New York did in The Division; full of trash, virus outbreak remanence, and chaos. One of the major issues The Division had was the bullet-spongy mobs and bosses, and the sequel addressed it. It seems there has been an all-around effort to fix this, starting with the sound effects as you can really hear when you hit a vital area. I have also noticed the vital areas are more sensitive now because even elite mobs and bosses can be killed super fast. Hazard effects like fire, explosives, and chemical damage seem to have more effect on those enemies as well. New animations like helmets getting blown off, armor breaking, and shields being destroyed all coincide with noticeable damage increases for anything elite plus. 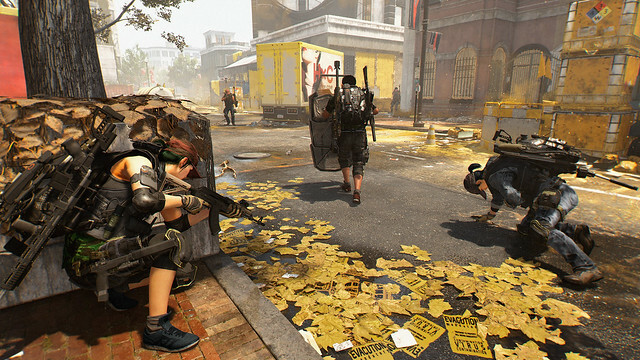 DPS in The Division 2 has had a major increase in the overall experience by cleverly utilizing sound, animation, vital areas, and smaller health pools. I did have some issues with cover which caused me to die a few times (situations like ladders or random items in the zone getting in the way and forcing me out of cover with no time to recover). World mobs are everywhere! It’s really difficult to go AFK when traveling on foot and somehow, no matter what, there is always someone on your flank. You can enter PVP death matches and the Dark Zone at a low level. The game will normalize your gear to create an even playing field in PVP situations. If you find yourself needing a break from the grind, this is a great place to relieve some stress … however, you cannot earn PVE levels here. 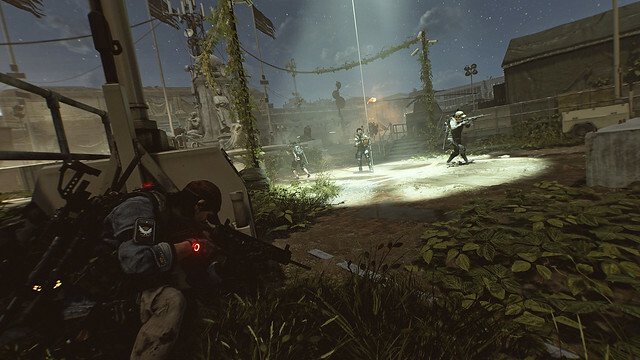 While playing in the Dark Zone, the player gains levels that are completely separate from the campaign and PVE side of the game. These Dark Zone levels unlock special perks and activate while inside any of the three Dark Zone areas of the game. While not completely overpowering, they do feel like a nice buff that allows the player to stay focused on their next goal. Unfortunately, the storyline was a bit lacking and didn’t include a ton of prolific cutscenes after the prologue. I found it easy to lose track of the story as I progressed through the levels. We see a common trend with looter-shooters; our characters being mute in the cutscenes which creates less of an affinity with the storyline. I never felt compelled by the story at any moment so it wasn’t the driving force for me to keep grinding to level 30. Regardless, The Division 2 is very addictive. Gameplay itself is a phenomenal experience that allows you to forget about the lack of a story. A constantly-changing world with a great dynamic of missions offers a massive variety of content for your leveling experience. Loot makes the world go around, and there is plenty of it! You always feel like whatever you doing to progress to level 30 has some opportunity to present valuable loot. Equipment upgrades are in a constant flow as you climb levels, keeping your character balanced with the difficulty of the content during your progression. 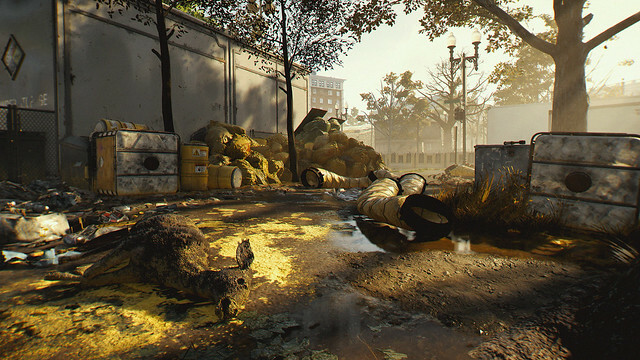 The Division 2 is designed for the mass community experience and the co-op leveling route is the way to go! This game is meant to be played with a squad which makes it such a great experience when playing with friends. Sharing loot, being revived, clan bonuses … it’s clear the developers are focused on the community aspect of the game. Succeed in the questline to unlock the clan interface by completing the Viewpoint Museum mission as soon as possible! You can drop into a friend’s game at any level and be scaled up to par, eliminating the feeling of a hard carry. 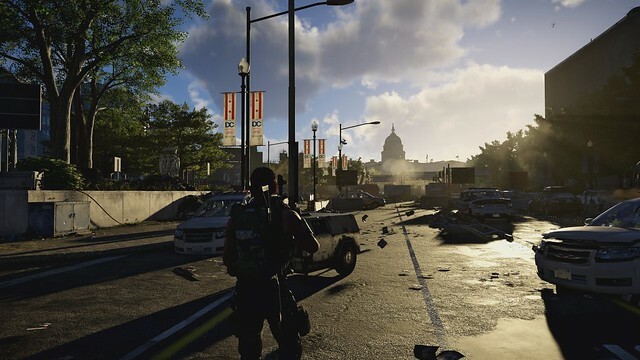 The Division 2’s leveling experience gives you a fully immersed universe in the post-virus era of Washington D.C. The backbone of the story is a bit lacking and the cutscenes are less than phenomenal. It was the gameplay which made the 1–30 experience such an awesome time with its constantly changing world environment, dynamic missions, and great loot rewards for your efforts. Be sure to find some friends to squad up with though … You’re going to need someone to watch your flank!